RPA-P7EX is a simple and high quality pre-amplifier, designed to focus on basic performance. Moreover, RPA-P7EX corresponds to the volume control of PURE DIRECT CONNECTION advocated by SPEC. RCA input signal is simultaneously transmitted to three RCA outputs and "terminal No.2" of the XLR outputs. The hot input signal received at terminal 2 of XLR input is transmitted to terminal NO.2 of the XLR output terminals and RCA output terminals simultaneously. The cold input signal received at terminal NO.3 of XLR input is transmitted to terminal NO.3 of the XLR output terminals. Each signal is selected with a mechanical selector for industrial use. Each signal is transmitted as it is via a buffer. Hot signal and cold signal are led individually to the output terminal without decoding the balance signal. This signal flow can be realized by having four amplifiers inside. A signal input to one RCA terminal and one XLR terminal can lower the level by 6 dB. 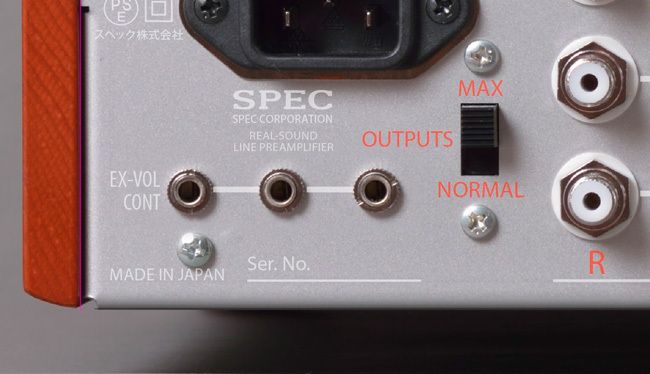 Whenever the "OUTPUTS" switch is set to the normal position, the RPA-P7EX will act as a generic preamp. Please connect to the power amp you already own. The output level of the RPA-P7EX can be adjusted by the front panel volume knob. As a PURE DIRECT CONNECTION using SPEC Power AMP. Set the "OUTPUTS" switch to the MAX position and set the "GAIN" switch of SPEC Power AMP to the EX-VOL position or SPEC-VOL position. Connect EX-VOL CONT terminal of RPA-P7EX and EX-VOL CONT terminal or SPEC-VOL CONT terminal of SPEC Power AMP with cable. With this connection, the analog attenuator embedded in the power amplifier can be controlled directly from the RPA-P7EX. PURE DIRECT CONNECTION sends the signal to the power amplifier at a high level, which results in crystal clear playback quality. Experience a sensation and a level of nuance that you have never heard before. You can control the volume with remote control. 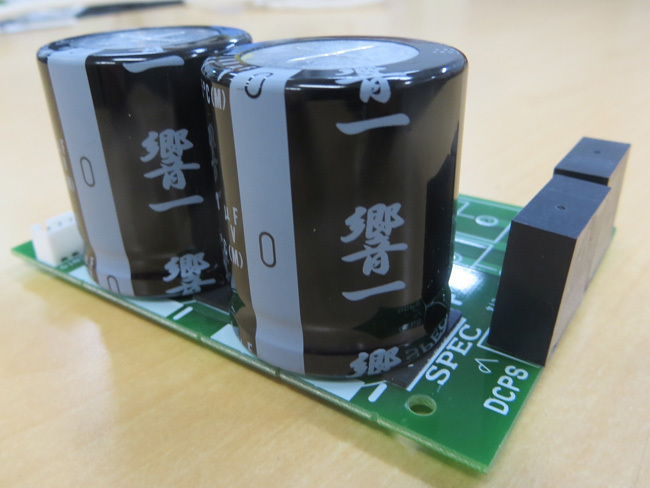 "PURE DIRECT CONNECTION" is a brand-new concept for the SPEC pre-amplifier and power-amplifier. As for the CONVENTIONAL CONNECTION, the signal is sent from pre-amp to power-amp with the level lower than the output level of the source device. Signal transmission at a small level loses a very small signal. It is also disadvantageous to S/N. "PURE DIRECT CONNECTION" is the transmission at a level of the source device. This method is the best way to transmit the original signal towards the final circuit of power-amplifier. Without missing information or degradation, "PURE DIRECT CONNECTION" enables truly realistic audio playback. Quality is maintained by carefully selected parts. SPEC is always looking for the best materials for sound quality. The quality is supported by these specially selected parts. produces clear and beautiful timbres. BELDEN1503 is used for the internal wiring material of the audio signal. MAX: PURE DIRECT MODE using volume control signal. 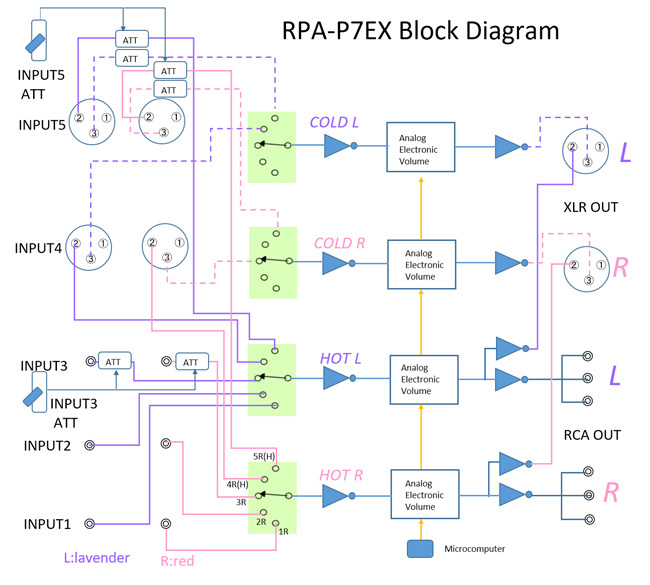 In this mode, the output level of the RPA-P7EX is fixed to the maximum. The volume control is done by controlling the attenuator embedded in the SPEC power amplifier using the EX-VOL CONT signal. 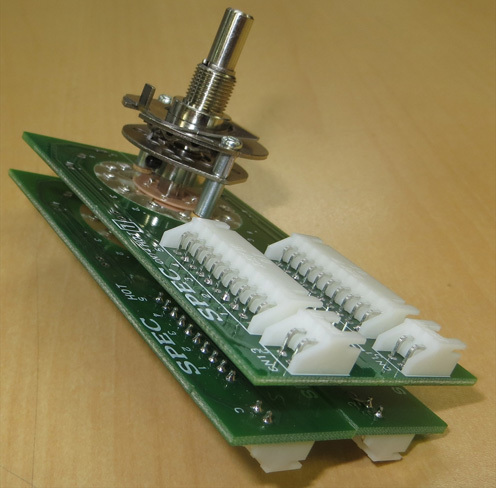 You can control the embedded attenuator with the knob on the front panel of RPA-P7EX. NORMAL: MODE for conventional POWER AMPLIFIER. 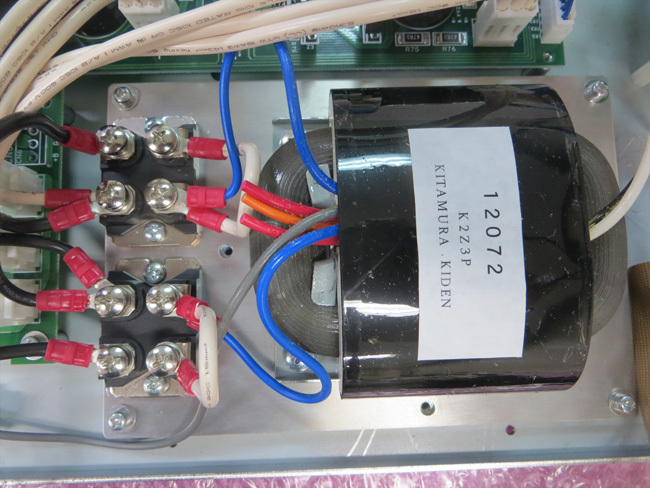 In this mode, the output level of the RPA-P7EX is controlled by the knob on the front panel of the RPA-P7EX. 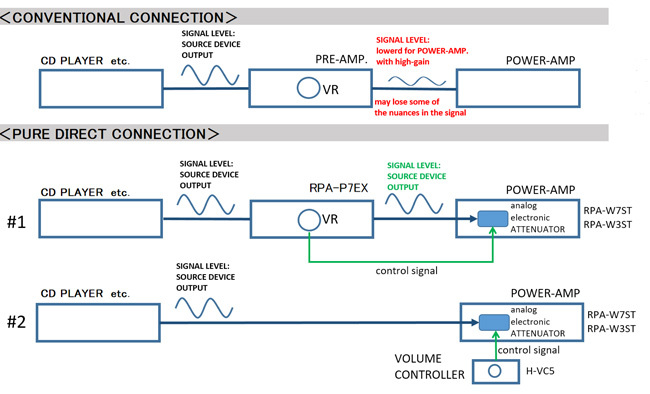 RPA-P7EX can control 3 SPEC power-amplifiers at the same time using volume control signal from "EX-VOL CONT terminal. 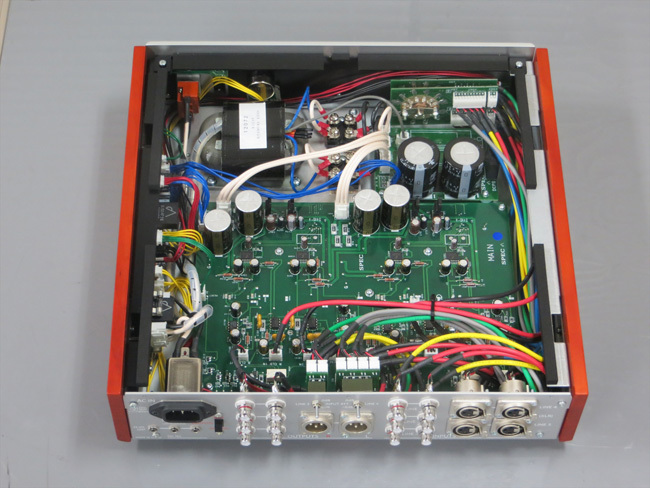 This is for BI-AMPING using 2 SPEC amplifiers or MULTICHANNEL DRIVE using 3 SPEC amplifiers.